Commodities priced in US dollar usually have an inverse relationship to the world's reserve currency. None more so than gold. Given the current geopolitical environment (spurring safe haven buying) and what's been happening on global financial markets (falling bond yields, tanking stocks and massive volatility), gold would be expected to be trading higher than today's $1,240 an ounce. 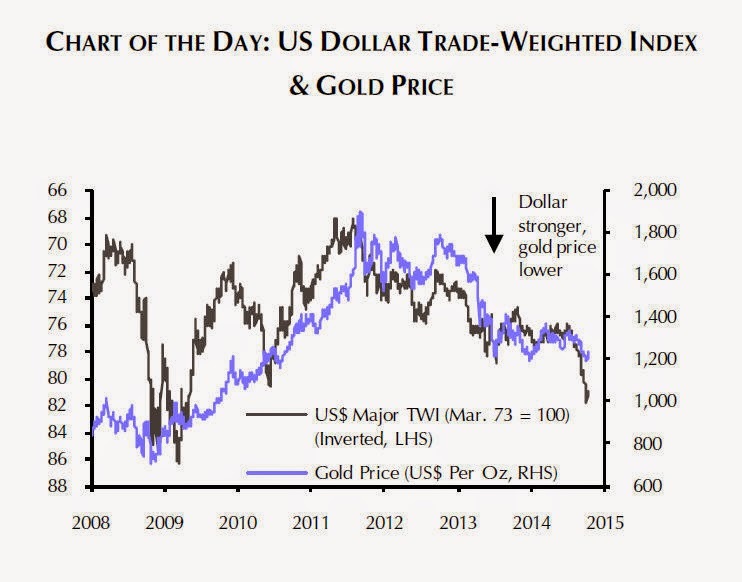 But as this chart shows the recent strength in the gold price has been into the teeth of a rampant dollar. Research house Capital Economics on Friday released the best chart I've seen to put the relationship between gold and the dollar in proper perspective. This latest episode is all the more remarkable given the strength of the US dollar. On the basis of the past relationship between the two, the price of gold might now be expected to be touching $1,000. Jessop believes "any reduction in support for gold prices from US monetary policy could therefore easily be offset by new positives, including policy easing elsewhere, higher volatility in other asset markets and strong physical demand from emerging economies." Capital Economics' house view is that the price of gold should rally to $1,300 per ounce next year, and to $1,400 in 2016.